Macy Ann McKnight had two home runs for Baylor. 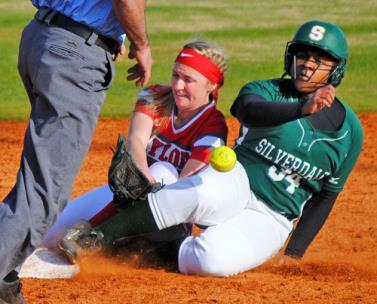 The Silverdale Lady Seahawks won their first state softball title last spring and there are high hopes for another season with similar success. 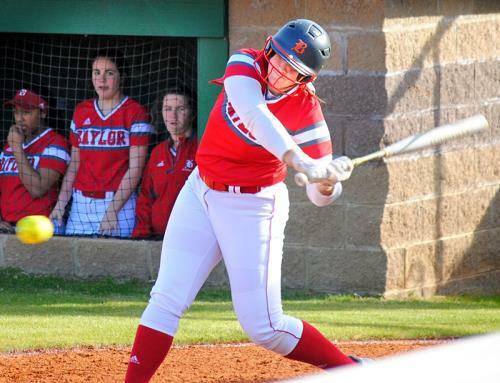 They found out on Monday afternoon that there’s still plenty of work to be done as they faced another defending state champ in the Baylor Lady Red Raiders. It wasn’t really very close as Baylor scored single runs in each of the first three innings while adding seven more in the final three frames to post a 10-2 victory at Silverdale. Baylor, still feeling good after winning the Runs For Rachel tournament at the Summitt this weekend, improves to 7-0 while the Lady Seahawks fall to 5-3. It’s been a challenging spring for all softball teams with all the rain and forced indoor workouts, but Baylor coach Kelli Smith is just happy that her girls played well against a worthy opponent and did so under clear, sunny skies. “I was pleased to see us score those early runs as we talk about winning every inning,” Smith began, her Lady Raiders having won the last four D-II-AA state titles and seven of the last eight. “It was good to see our bats get going because Maddie Tankersley is a quality pitcher who has given us fits in the past. I liked the way we approached the plate as we had runners on base in every inning. And I thought that Macy Ann McKnight pitched really well and even helped herself with those two home runs,” the Baylor coach added. McKnight was the winning pitcher for the Lady Red Raiders as she allowed two runs on five hits while striking out five and walking three. She swatted a 1-2 offering in her first at-bat for a solo homer that bounced on the entrance drive past the fence in right. Then as the leadoff hitter in the sixth, she connected on the first pitch for another solo shot almost to the same place. The Lady Seahawks had runners on base every inning too, but they only had single runs in the fourth and seventh innings to show for their work. Skyler Sheridan led off the fourth with a double and went to third on a grounder to short by McCade Cooper. Tankersley walked before Sheridan scored on a bunt single by Delaney Phillips. Another walk to Ansley Junkins loaded the bases, but McKnight dodged further damage when Kenzie Manning lined to short for the second out before courtesy runner Piper Brown was doubled off third to end the threat. Savannah Turner hit an opposite-field solo homer in the seventh to account for Silverdale’s other run. McKnight has pitched in some big games so far in her Baylor career. Coach Smith might have thought about pulling her in that fourth inning, but the double play saved the day for all involved. “I had some highs and lows out there today,” the 17-year-old junior expressed afterward. “I think I got a little tired in that fourth inning as I haven’t pitched a complete game so far, but I was able to battle through and my defense made a huge play to save me. As far as the home runs, they were pitching me outside, so I just had to wait for inside pitches and that’s what I did,” she added. While McKnight had two round-trippers for Baylor, shortstop Ace Sellers hit a two-run homer in the fifth. Then in the sixth following McKnight’s second blast, Sophie Piskos drove in a pair with a single. Raven Jones, who led off the seventh with a double, scored on a fielder’s choice by Bailee Stack while Stack scored Baylor’s final run on Abby McNamara’s third hit of the day. Silverdale coach Tim Couch knew his team would have their hands full and he was completely right. “That was a whipping for sure, but that’s the best team in the state and one of the best hitting teams I’ve seen in a long time. They are so good fundamentally. That’s where we want to be, but we’re just not there yet,” Couch said before dragging the infield. “I was hoping that we’d hit better, but we also knew we had to play near-perfect softball to have a chance. I thought Maddie pitched well for the most part, but it’s always a challenge when you play a team like Baylor and I’m sure this experience will only help us get better on down the road,” Couch concluded. McNamara had three hits and scored twice for Baylor while McKnight was the only other player with two hits. Piskos, Sellers and McKnight all drove in two runs apiece. Sexton also had a double while Sheridan and Tankersley had the other two hits. Silverdale will be at home again on Tuesday to host GPS while Baylor will travel to Murfreesboro later in the week to take part in the Southern Warrior Classic where they will face some really good out-of-state teams. While McKnight was the winning pitcher, Tankersley was the loser after allowing 10 runs on 10 hits. She also walked five and struck out four. McKnight and Piskos; Tankersley and Turner. Silverdale’s Skylar Sheridan slides safely to 2nd under Baylor’s Abby McNamara.